Muslims around the world are marking the entry into an Islamic New Year as September 11, 2018 was officially declared the first day (1st Muharram) of the year 1440 Hijri. Muharram is the first month of the Islamic calendar. According to the calendar used across most of the Arab world, Muslims have entered the year 1440 Hijri. It is referred to as the Hijri Calendar because it began with the Hijra, or hegira, i.e. the Prophet Muhammad’s migration from Mecca to Medina (in present day Saudi Arabia). Muhammad and a number of Muslims at the time migrated to Medina due to persecution by the disbelievers. The first Muslim state was established in Medina till he returned to Makkah after a conquest years later. The occasion comes with very little celebration as compared to January 1st in the case of the Gregorian calendar. Except for Muslim dominant nations, it is a normal day across most secular countries. In parts of northern Nigeria for instance, state governments have declared the day a holiday to allow residents observe the day as such. The Saudi Press Agency, SPA, and the Islamic Society of North America, ISNA, all declared September 11 as the official date for the start of the New year. SPAsaid in an article: “The Supreme Court has announced that tomorrow, Tuesday is the first day of Muharram,1440 H corresponding to 11th September 2018. As per Islamic traditions, Muslims have two main celebrations annually in the mould of Eid-ul-Fitr (Post Ramadan feast) and Eid-ul-Adha (feast of sacrifice). Unlike the Gregorian which has 365/366 days, the Islamic year has minimum 354 days. This is because the Hijri Calendar follows the movements of the moon. 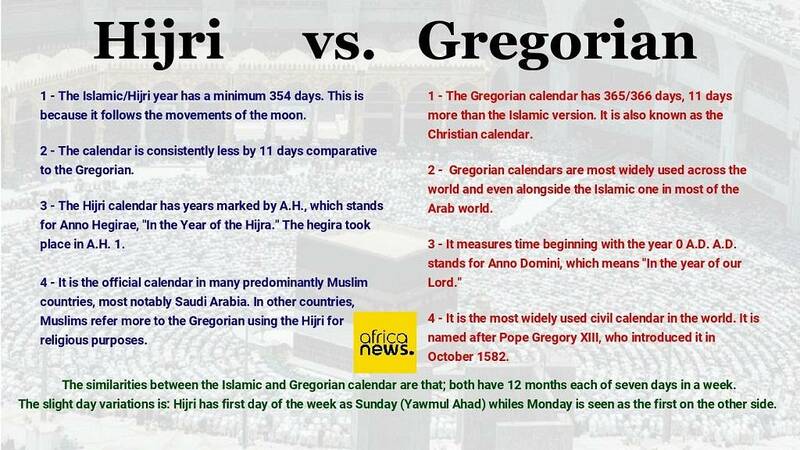 The Hijri Calendar is consistently less by 11 days comparative to the Gregorian. Gregorian calendars, which are most widely used across the world and even alongside the Islamic one in most of the Arab world, on the other hand measure time beginning with the year 0 A.D.
A.D. stands for Anno Domini, which means “In the year of our Lord.” The Hijri Calendar has years marked by A.H., which stands for Anno Hegirae, “In the Year of the Hijra.” The hegira took place in A.H. 1. The Hijri Calendar is the official calendar in many predominantly Muslim countries, most notably Saudi Arabia. In other countries, Muslims refer to the Gregorian Calendar for most dates and consult the Hijri Calendar only for religious purposes. The similarities between the Islamic and Gregorian calendar are that; both have 12 months each of seven days in a week. The slight day variations are that the first day of the week is Sunday (Yawmul Ahad) whiles Monday is seen as the first on the other side.